Playing without LaMarcus Aldridge, who had missed seven consecutive games with a low back contusion, the Portland Trail Blazers were starting to struggle. Though still fifth in the Western Conference standings, Portland had gone 3-8 in its last 11 games and was only a few games from falling outside of the playoff picture. On Thursday, however, Aldridge returned to record 25 points and 16 rebounds in a 100-85 win over the Hawks in Atlanta. With Portland in Chicago on Friday, Bulls coach Tom Thibodeau said he’s preparing for a Trail Blazers team that has returned to its high level of play. It’s Aldridge in particular who will require a team effort from the Bulls to try and contain. The 6-11, 240-pounder is averaging 23.4 points and 11.1 rebounds on the season. Chicago enters Friday’s game after a three-day break. On Monday, the Bulls recorded what Noah called one of their biggest wins of the season, an 89-77 victory over the Pacers to close out their season series with Indiana at 2-2. Noah, however, wasn’t ready to concede that the Bulls are playing as well as they have all season. 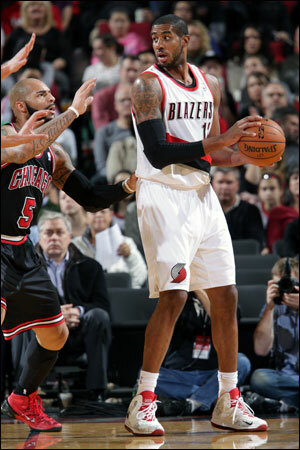 Earlier this season, Portland defeated Chicago 98-95 as Matthews posted a game-high 28 points. Chicago has dropped five straight contests versus Portland, including five straight at home. In their two meetings last year, Aldridge averaged 23.0 points against Chicago, while Noah averaged a double-double with 17.0 points and 10.5 rebounds. Expected to be considered for NBA Defensive Player of the Year honors, Noah will be counted on to help defend Aldridge. The Bulls will clinch a playoff spot with a win or a New York loss in Phoenix. In his 14th full season with the Chicago Bulls, Adam is responsible for creating, producing, updating, improving and monitoring the content and business portions of the team's official website, Bulls.com … he also oversees the mybulls e-newsletter and assists with the organization’s social media efforts … Adam got his start working as an intern in the Bulls ticket department … originally from Geneseo, Ill., he attended Augustana College in Rock Island, Ill., and graduated with a B.A. degree in Business Administration-Finance in May 1999.